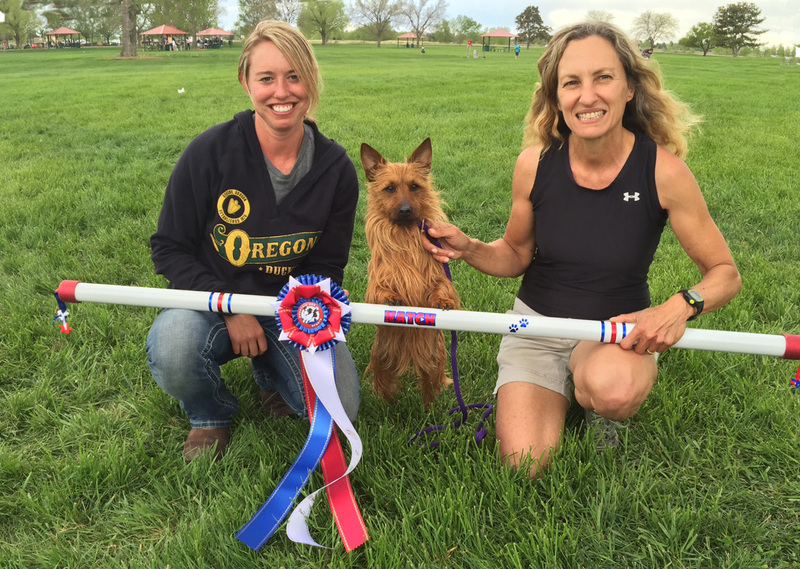 What a fun weekend we all had at a NADAC trial. Nice site, nice weather, nice competitors, miles of nice hiking trails, and nicely behaved dogs. Nice. Nice. Nice. (above) Our only Bonus Box attempt this weekend. I knew we’d likely have trouble with that turn AWAY, since its a skill I have not trained out of tunnels (yet) but Lil did a great job running this course… and this was her 6th run on Day 2. Yey Lil! The reason I only attempted one Bonus Box last weekend, was because I’m currently focusing my attention on running with Lil at moderate distances to freshen up my handling skills. While Bonus runs are difficult to GET, they are actually easier in terms of handling because you can see the whole course, your dog, and your dog’s path perfectly due to being on the outside looking in. Yesterday, I signed up for Amanda Nelson’s Exercise of the Month to help me get back in the swing of things re: running with Lil.. not that I’ll be running right along side of her. Bruce brought Jake to the trial on Sunday. I’m sure Jake appreciated spending Friday and Saturday relaxing at home. Takoda was super well-behaved at the trial, and very quiet while hanging out ringside. He was also able to maintain his compusure 🙂 around his litter mates who were in the tent next door. Lots of great heeling and Mark work in the midst of trial distractions too. I didn’t get any video of Takoda at the trial site but I finally got some footage of him heeling in the backyard the previous week. (above) More heeling in that same session. I’m so impressed with how well Takoda is responding to my body language and how straight he is walking, trotting, and sitting in heel position. 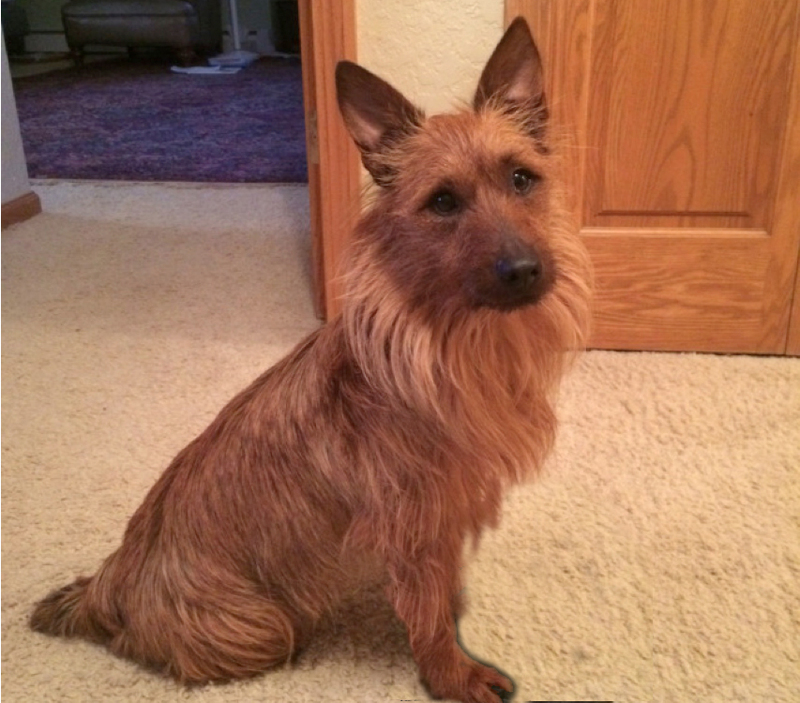 He has always been better on my right (likely due to him having a left lead preference). Because of that we spend more time practicing with him on my left and at this point I think he is almost as good on my left as on my right. He is such a good puppy! 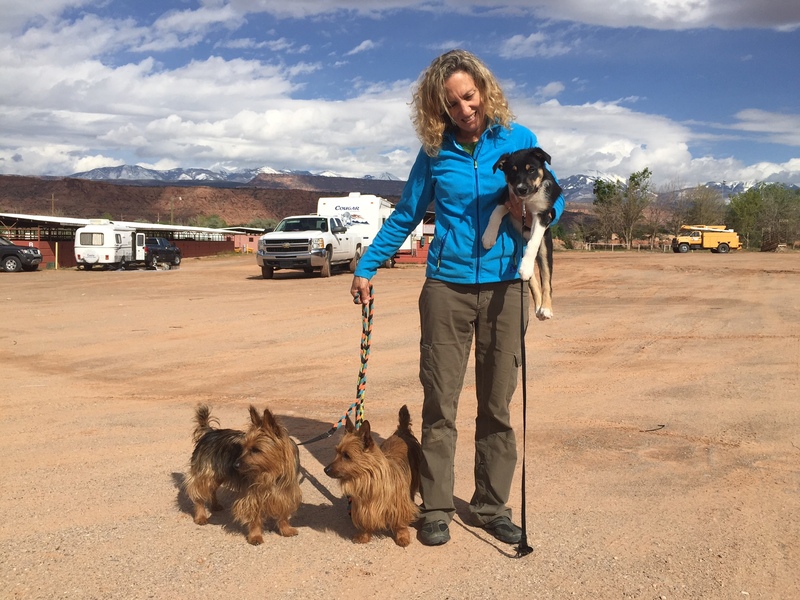 We spent the past week in Moab, Utah, participating in a three day workshop led by Sharon Nelson followed by a Fun Raiser (trial). Its the second time I’ve had the good fortune to work with Sharon in person and learned a ton. What a great group of people and dogs. It was as much fun to watch other teams run as it was to run Jake and Lil. Over the coming days, I’ll be transcribing my notes to make sure I remember every single DIAMOND Sharon shared with the group.. and there were plenty. I’ll be writing a separate post about Jake and Lil’s experiences in Moab including Jake’s highs and lows (there were plenty of both) and Lil’s fantastic runs both in the workshop and Fun Raiser, including a Bonus Box Q. But this post will be mostly about Takoda, who will be 12 weeks old tomorrow. This was Takoda’s first long trip in the RV and he was a very good puppy. He traveled well and was perfectly quiet unless his antler fell out of his crate, which I later realized he was pushing out intentionally to engage me by putting it back in his crate. He started doing this the previous week at home but I didn’t put it together until I watched him methodically push the antler through a small opening on his crate door as soon as I had pushed it back in. HA HA. The joke was on me! In terms of potty training, throughout the trip Takoda let us know when he needed to go potty and he didn’t have a single accident. 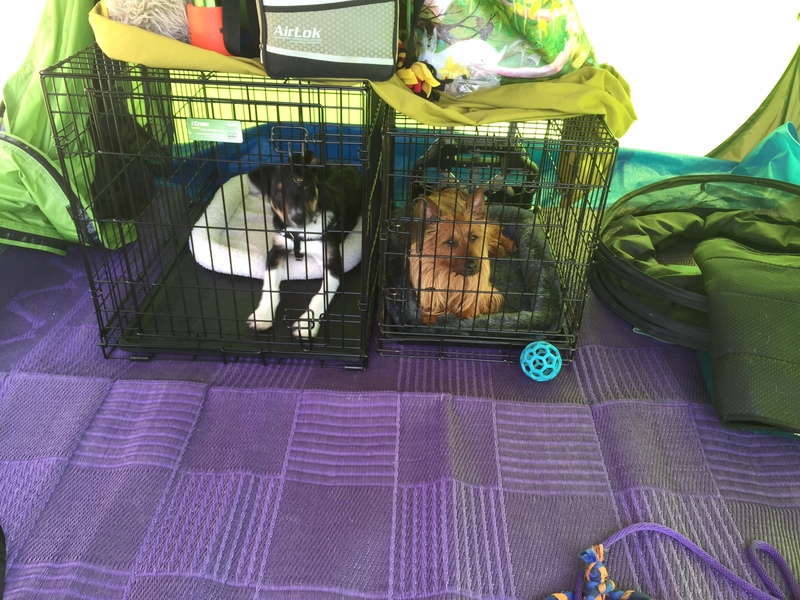 I had set up an elaborate Expen area outside the RV to make pottying a breeze for all concerned. At one end was a 4 x 6 feet area with artificial grass which was the designated potty area (the grass had been previously “seasoned” at home). The adjacent area was 6 x 21 feet and covered with interlocking rubber matting to provide a non-slip area to play and work on. 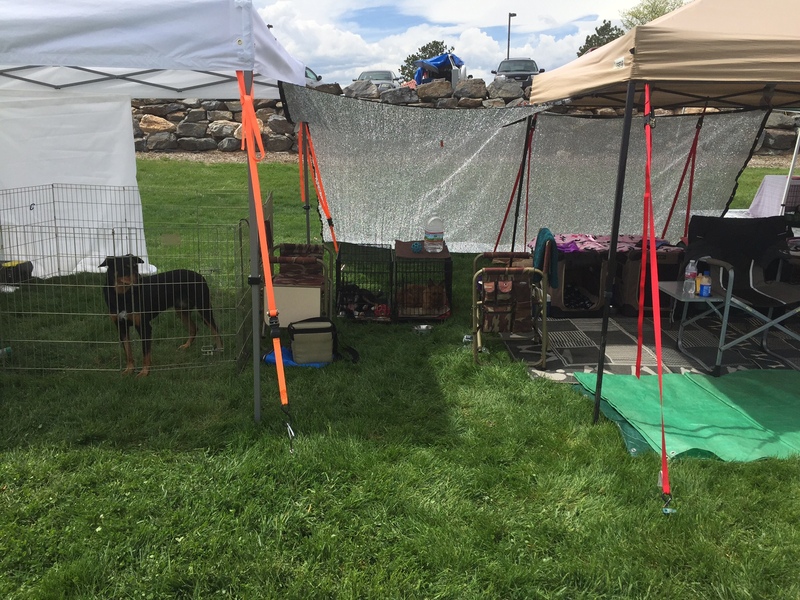 The only bummer was the weather was so bad most of the time, we barely used the matted area but Takoda certainly made good use of the potty area, which drained well and was rinsed off by rain so it remained neutral in terms of scent (for humans). It was so nice to be able to say GO POTTY and watch Takoda walk down the ramp and potty on his own without me having to go with him especially during the massive sand storm with wind gusts so powerful they moved the Expens, or during the day and night of pouring rain. He was a real trooper. Given the rough weather, I felt very lucky we had the RV for playing games like “This one is getting away!” which involves me rolling a donut toy on the floor and while Takoda runs after that toy, I bang the other donut toy on the floor, which brings him back with the first toy so I can say “This one is getting away” and roll the second toy. An RV is so much nicer than say…. a bathroom for playing games in contained spaces to keep a puppy from running off with toys. We only played it a couple of times but by the time we got home, his understanding about bringing toys back had improved considerably in the kitchen. Agility people are great for this type of puppy training. They wait patiently, avoid eye contact, and act aloof until the puppy has met criteria and then quickly swoop down to interact before the puppy has a chance to jump up out of the sit. So for Phase 2, Takoda will only be meeting people who know how to greet a puppy in the manner described above, which is not going to be happening very often in the coming weeks. I think the timing is perfect to take a break from meeting a gazillion more people because as Sharon and Sue both pointed out, Takoda and his litter mates are very well socialized and do not need to meet more and more people and dogs at this point. I have Heather to thank for that. She did a great job raising and socializing this litter. Takoda spent a fair amount of time in a crate during this trip and I decided to take advantage of his positive experiences in a crate by removing the Expen I had set up in our kitchen. 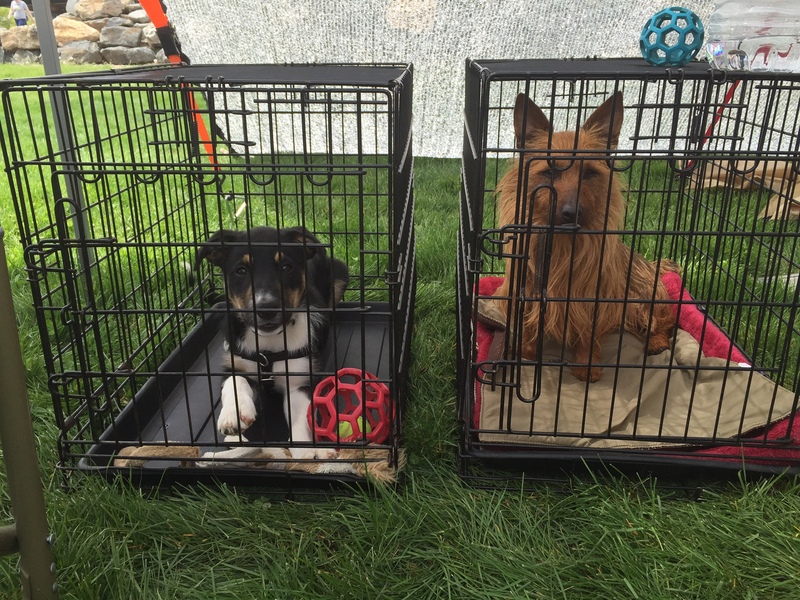 Previously I had a crate inside an Expen, which was in our kitchen that had dog gates to keep Takoda from wandering around the house. The Expen took up way too much space for long term use but the triple containment system worked perfectly for the first couple of weeks because it allowed three different levels of freedom based on how much attention I was able to give him at any given time. He was only in the crate when I was totally preoccupied with something else or elsewhere. He was in the Expen when I was sort of watching him but busy doing something else in the vicinity of the kitchen where I could still see him. He had full run of the kitchen when he had my undivided attention. This kept undesirable behaviors to a minimum while also beginning to work on being quiet in a crate and Expen, which has been quite challenging so far. Takoda also spent time in the arena crated next to Jake and Lil during the workshop and he did fairly well except when I worked Jake or Lil. He also tended to vocalize when he heard people praising their dogs or when the entire group WHOO-HOOed for dogs with higher pitched tones, similar to the tone I use when praising. I plan to experiment with shifting my praise tone to a lower-pitch because I think the higher pitch creates more arousal which is not a good thing for a puppy who is quite vocal to start. Time will tell if teaching Takoda learn to remain relatively calm and quiet around other dogs and people is going to be a huge challenge or a moderate one. I remember Lil going through a phase of vocalizing in agility environments. It was so annoying but I don’t think it lasted very long. I hope the same will be true with Takoda. Sometimes being WRONG is Fantastic! At last weekend’s trial I was 100% certain Lil did NOT have the necessary skills for one Bonus Box run so I didn’t even attempt it… but lo and behold, when I set up a similar scenario on the yard this morning, she totally surprised me. 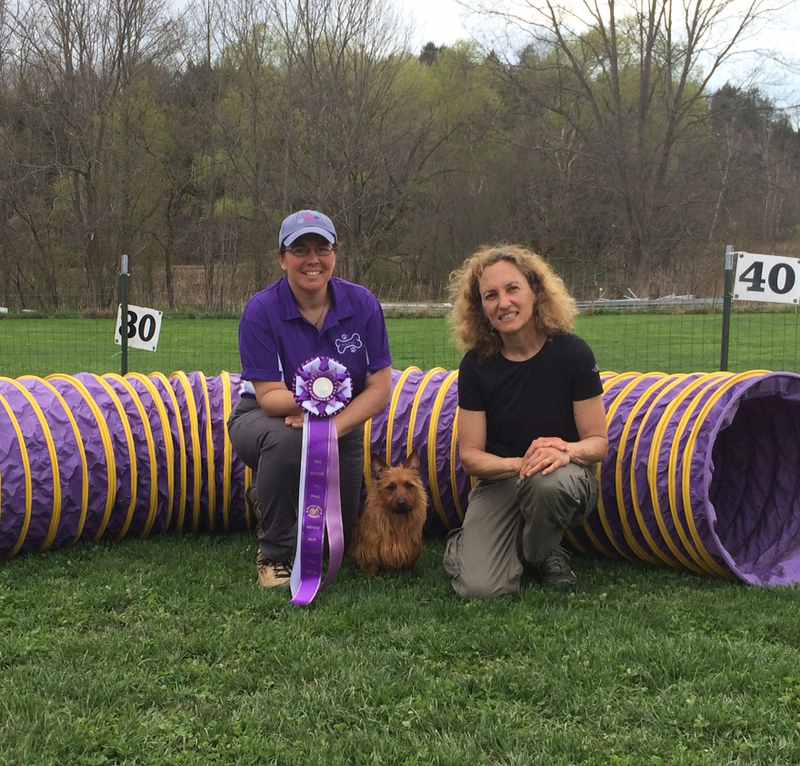 Lil earned her NATCH at NAE trial at Sugar Bush Farm. I could not be more proud of Lil. 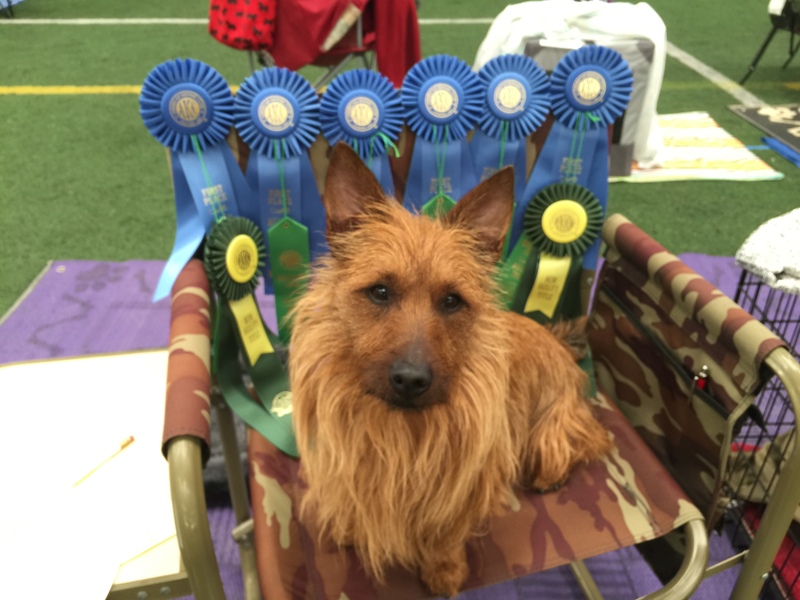 She is a such a great teammate: super smart, willing, and able to fly around agility courses in true Australian Terrier style. GO GO GO Lil! Huge progress with “Forward Focus.” Lil is now able to focus forward on nothing (in partcular) and with a little more duration. In this session, Lil is practicing “forward focus” while looking at nothing (in particular). In the past couple of days she has begun to offer the behavior in her day-to-day life (which I’ve been rewarding) and is able to hold “forward focus” for a bit longer. She is one smart little girlie! For non-dog training fanatics, this video might be like watching paint dry but this is a very complex trick to train. Dogs have zero natural incentive to look at nothing so the fact that Lil is willing to stare into the distance for even a moment or two means she understands what I am asking of her and she trusts that she will be rewarded even if she cannot see me when she is doing the behavior. Here are a few of Lil’s runs from our first outdoor trial of the season. I could not have asked for better weather, which makes outdoor trialing even more fun than usual. Not much to say about the video other than I think well Lil ran very well! On day one, she felt a bit scattered but surprisingly it was not visible on the video. By day two, we were back in “the zone” and she felt super confident. Her running contacts looked either good or great all weekend long. There was just one A-Frame I didn’t like but she hit the contact zone so I shouldn’t complain. 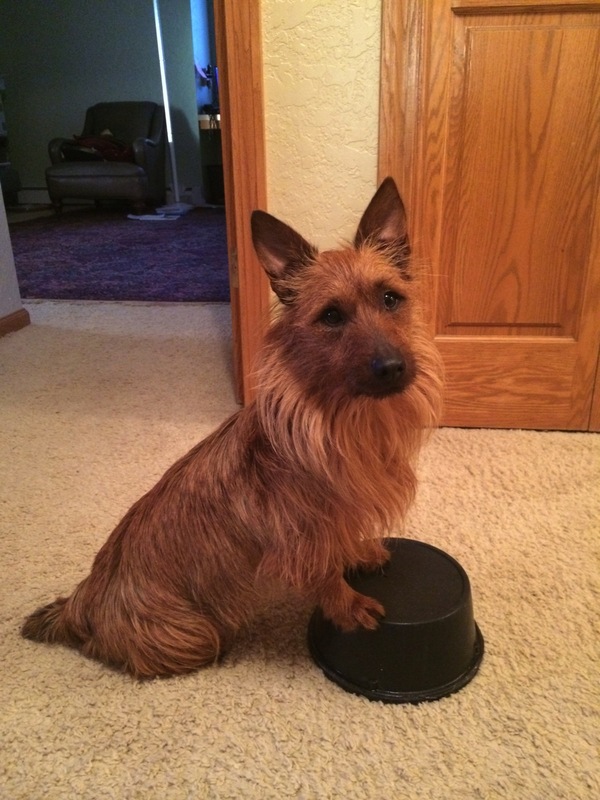 Over the winter, I focused a lot of attention on forward sends and increasing distance with both dogs. I am so pleased to see how well the training translated to the trial environment. Both dogs ran really nice clean lines all weekend, including Lil’s Elite Chances run and Jake’s Novice Chances run, which they both aced. I stumbled upon this video of Lil running her very first agility course (Tunnelers) at Camp Gone to the Dogs. She was only 7 months old, but I think she was already exhibiting what makes Lil a great agility partner and family member. GO LIL!